For years, I was under the impression that the word "coupe" means a car has two doors, but the German automakers seem dead-set on proving me wrong. 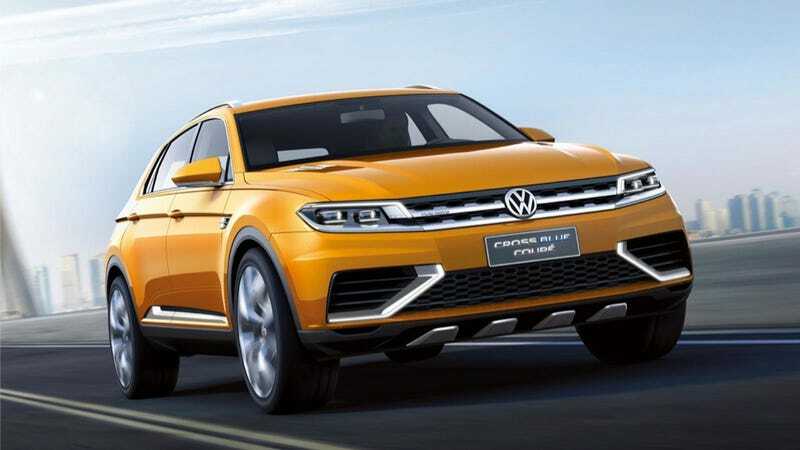 The latest example is this: the Volkswagen CrossBlue Coupe Concept, which does not have two doors but is called a "coupe" anyway. It also isn't blue either. It's orange. I mean, I assume if it goes into production some of them will be blue, but... wait, does "blue" actually mean "orange" now? I don't know what's going on anymore. Photos the concept SUV surfaced online today ahead of its likely debut at the Shanghai Auto Show. If you think that Volkswagen has pulled this kind of thing before, you're right. First there was the Cross Coupe Concept from way back in 2011, as well as the CrossBlue Concept from this year's Detroit Auto Show. The CrossBlue was a big three-row SUV, and this one appears to be smaller, so we can presume it's going to inspire the next Tiguan mini-crossover in some way. Styling-wise, it's very much in line with the upcoming Golf, inside and out. I don't think it's a bad-looking car at all. But I can only speculate as to why it's called a "coupe" despite having four doors, just like the Mercedes-Benz CLS and BMW 6-Series Gran Coupé. Maybe I just don't know what words (or colors, apparently) mean anymore, or the Germans are intent on redefining it. Once they figure it out, have them let me know, okay?